I am a passionate life extensionist. I am a passionate conservationist. I have been living with a contradiction, increasingly stark as my understanding of both these causes, and my commitment to them deepens. Nearly 20 years ago, I first became convinced by a variety of experimental evidence that aging is programmed into our genes by evolution. It was five years after that that I had my first inkling how this could be. This led to a study of evolved population regulation, and I became exquisitely aware of the entanglement of evolution and ecology. Why would evolution create something as antithetical to the interests of her children (individually) as aging unto death? A gene for aging is the opposite of a selfish gene. And yet it is abundantly clear that we have genes* with no other purpose than to kill us. Suicide genes. My principal contribution to the field of aging research is the Demographic Theory of Aging, which says that aging evolved for the purpose of population stabilization. There have been other theories of programmed aging in the past, usually based on the need for population turnover to assure adaptability, ongoing evolution and the ability of a population to change as conditions change. What I demonstrated (first in a 2006 paper ) is that population dynamics provides a far more potent selective force than this. Yes, the need to maintain population diversity and to change over time is certainly real . But (for animals) the need to avoid population overshoot and subsequent crashes to extinction is far more urgent (not so for plants). All animals depend on an ecosystem, and if they grow faster than their ecosystem, they are doomed. Not doomed “eventually” in some abstract, far-off morality tale. They are doomed within a generation or two. Every animal population must have the latent capacity to grow quite rapidly in a pinch. You can translate this to mean, roughly, that a population must be able to double in each generation when it is threatened or expanding freely into a new and fertile environment. Human families in indigenous cultures can produce 6 or 7 babies, 4 of which survive to breed. Roundworms can lay 300 eggs, 2 of which survive to breed**. And, of course, microbes reproduce by cloning and double exactly with each generation. But the doubling of a population that is already at carrying capacity can spell disaster. Every blade of grass is eaten, or every rabbit is hunted, or every tree is denuded, and the ecosystem crumbles from the bottom up. An ecosystem is a food web–predator and prey, the predator’s predator and the prey’s prey, multiply, connected and entangled, in an intricate network of interdependencies. Stability of the network does not come for free. There is no “invisible hand” that produces a grand harmony from a thousand selfish actors. Rather, there is deep and ongoing coevolution. Natural selection has taught each species cooperation and restraint via a billion years of tough love. Those species that overreached to trash their own ecosystems brought their ecosystems crashing down, and their rapacious behaviors died with them. Ecosystems are resilient. There is an ability to bounce back after disturbance, from a natural disaster or the loss of a keystone predator. This, too, is a property honed by natural selection, a strength of the community that has evolved gene-by-gene in its component species. The unexpected happens, and the ecosystem has to deal with it. Those ecosystems that can’t recover from an invasion or a decade of bad weather have long ago disappeared from the biosphere. But recovery of an ecosystem requires time. Bouncing back after a small disruption may require a dozen years or a dozen dozen. Bouncing back from a major geologic or climate event requires thousands of years. And in the history of multicellular life there have been five major extinctions. Each time, the biosphere required tens of millions of years to recover. We are now in the midst of the sixth global extinction , and as far as archaeology can tell, the anthropocene extinction is as deep and as rapid as any the earth has seen. And how did we get here? I believe the road to the Sixth Extinction was paved with ideology. I speak not just of the Biblical ideology that says it is our place to “be fruitful and multiply, and fill the earth and subdue it; and have dominion over the fish of the sea and over the birds of the air and over every living thing that moves upon the earth.” [Genesis 1:28] There is also the dominant version of Darwinian ideology that admits no explicit need for cooperation, but celebrates the creative power of selfishness. Worst, perhaps, is the capitalist ideology that assigns no value to anything that cannot be translated into dollars , and that demands perpetual growth in order to support a return on investments. Does Life Extension Contribute to Overpopulation? Well yes, of course it does. Human history since the advent of agriculture has been a quest to tame the environment, to substitute predictable domestication for nature’s wild ride. We have done this to avoid death and the risk of death. The gap between falling death rates and falling birth rates produces a population surge. Currently, Africa is the last continent where technology is finally moving in to increase life expectancy, and the African birth rate is coming down, but not fast enough to avoid devastating population increases. Over the next 30 years, the population of Africa is expected to double from 1.1 billion to 2.4 billion, a larger absolute increase than the rest of the world put together. 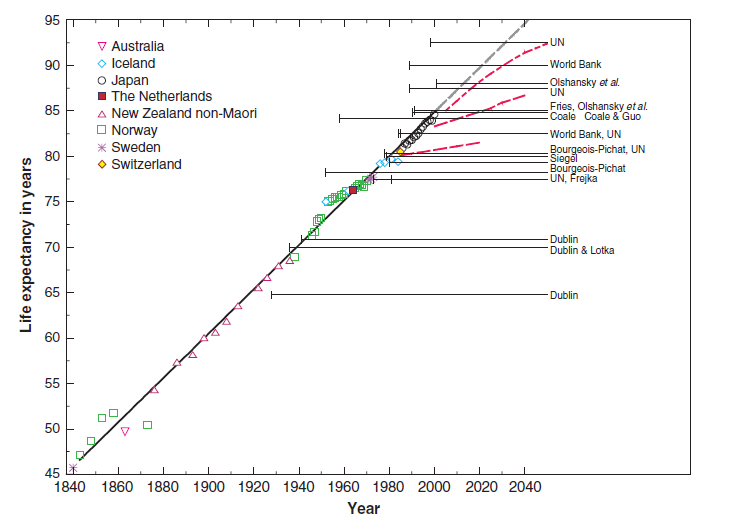 Life span in 1840 was about 40 years in the world-leading European countries. In 2015 it was 83 in Japan and Scandinavia, the present world leaders. And indeed, the increase has been quite steady and gradual, so that “one year for every four” is an accurate characterization. For the first 120 years, increased life span was a story of early deaths prevented. Before about 1970, all this progress in life expectancy was achieved by preventing people from dying young, benefits reaped from antibiotics, hygiene, and workplace safety. But since then, a remarkable thing has happened: the maximum human life span has risen, and continues to rise at an accelerating pace (as recounted by Oeppen and Vaupel). What is more, people in their seventies and eighties are healthier today than ever before. Although there are dramatically more seniors in the population, the proportion of the population in assisted living and other dependent care situations is not rising. This is just what we wanted–we are staying active and healthy longer, retiring later, delaying the ravages of old age and “compressing morbidity” of late life into a shorter endgame. World population at 7.3 billion is about ten times what it was in 1800. A tenfold increase over 200 years is a good run, but it’s not unusual in the context of the biosphere’s history. Far from it. Bacterial populations routinely expand by a factor of a million. Insect populations can boom and crash. There are many examples even of large animal populations that have grown far faster than Man. But other population increases have been local, while the rise of mankind has been all over the planet. We are now a global population, adapted to living in deserts and jungles, snow-capped mountains and forests and fields. We mow them all down, or burn them, or pave them over. Man has put many other predators out of business, from mastodons and sabre-tooth tigers to moas to a slew of toads and salamanders in the present age. We inhabit every corner of the earth and have wrought just as much devastation on the seas–perhaps more. Technology has enabled us to dominate such a wide range of other species, and it has made human beings a uniquely devastating competitor. Will we Destroy all Life on Earth? Eradicate Gaia? Life is bigger and more robust than anything we are able to disrupt. No, the threat is not to Gaia but to ourselves. Life will eventually roar back, more diverse, more wondrously inventive than ever. But recovery from a mass extinction requires, typically, a few tens of millions of years. That’s nothing for Gaia, but for our grandchildren, 30 million years may try their patience. There is life in boiling hot sulfur pits and life on the pitch black ocean floor, thriving under pressure that would crush a SCUBA tank, and life embedded in dry rock, equally deep under the land, living on who-knows-what. There are spores that were trapped in salt deposits 250 million years ago, recovered by scientists and brought back to life in the laboratory. To eliminate all life on earth is far beyond humanity’s destructive power for the foreseeable future. But can we imperil the ecosystem that sustains human life? Quite possibly we can. We may imagine the worst case scenario is that we destroy all of nature, lose all biodiversity and turn the earth into a vast farm to feed 20 or 30 billion humans. But it’s a good bet that this kind of world cannot be, and it is certain that we don’t know how to create it. Ecosystems are complicated and interdependent. From bees to bacteria, our farms and our pastures and livestock all sit atop ecosystems that we do not fully understand. Already, we are washing into the sea each decade topsoil that took 1,000 years to create . Farmers rent hives of pollinating bees, and the beekeepers are keeping them alive with increasing difficulty . For nitrogen-fixing bacteria, we have substituted saltpeter that we mine from the ground until there is no more of it left to mine. Factory farming and antibiotics are two of mankind’s most successful and heavy-handed biological interventions. Each has worked spectacularly well for a few decades, and we have perhaps a few decades more before each will as spectacularly fail. We have that much time to create more sustainable replacements. No, a world of monoculture to feed humans is not a viable world. We are animals. From an ecosystem we derived, and, for the foreseeable future, on a natural ecosystem we will continue to depend. We are not nearly smart enough to build an artificial ecosystem to support human monoculture. In all likelihood, the end of natural ecology would be the end of humanity. Poets bemoan the loss of our spiritual connection to nature. Meanwhile, ecologists warn us that we are starving more than our spirits. We can’t engineer our way out of this. We don’t know how. We can’t understand or model ecosystems, so we have no idea how to move them in a given direction, even if humanity had the collective will to do so. If we destroy the ecosystem we have, we will have to wait for nature to take her course, and the wait is likely to be tens of millions of years. Many of my colleagues in the life extension community lean to libertarianism, and in some ways I am with them. I am frightened by our disappearing Bill of Rights, corporate takeover of the Free Press, exceptions to habeas corpus, wholesale domestic surveillance–and all this in service to perpetual war which most Americans want no part of. But overpopulation and ecological collapse are problems that cannot be addressed individually. China realized decades ago that we cannot allow each family to decide how many children they wish to have. Still less can we condone men who impregnate women and walk away; and worst are the institutions that seek to preserve the morals of other people’s children by denying them knowledge of basic reproductive biology. We will have to find ways to come together. The good news is that polls show consistently that people are aware of the threat and willing to put aside their own (short-term) economic interest to address it. (This despite concerted efforts to downplay the issue in the media.) The bad news is that present political structures will not address the problem. Our existing political order is, in fact, a big part of the problem. Politics is dominated by capitalist megacorporations that have their own agenda, and preserving the ecological foundation of human life is not part of it. Subversion of democracy by capitalism may have taken root in America and West Europe, but it is now a global blight. I invite your thoughts and ideas about how to do this. The more dramatic images in this column were taken from the book Overdevelopment, Overpopulation, Overshoot , published this year and available free online or for purchase in hard copy. * Aging genes or the equivalent, combinations and epigenetic networks that work to ensure that our bodies weaken and ultimately self-destruct over time. ** Since they are hermaphrodites, each worm can breed without a partner, and so needs only 2 surviving offspring rather than 4 to double its population. What do you think about all these countries which now have have declining populations? Should the government FORCE the people to have more children? A number of nations today, stretching from North Asia (Japan) through Eastern Europe, including Ukraine, Belarus, Moldova, Estonia, Latvia, Lithuania, Bulgaria, Georgia, Armenia, and into Central and Western Europe, including Albania, Bosnia, Croatia, Serbia, Slovenia, Germany, Hungary, and now Greece, Italy and Portugal, along with Puerto Rico in the Caribbean, now face long-term population decline. Countries rapidly approaching long-term population declines (but currently still growing, albeit slowly) include Spain, Cuba, Uruguay, Denmark, Finland, and Austria. Russia is also facing long-term population decline, although for the moment there has been a reversal due to an increased birth rate. Many nations in Western Europe (and the EU as a whole) today would have declining populations if it were not for international immigration. The total population of the continent of Europe (including Russia and other non-EU countries) peaked around the year 2000 and has been falling since 2004. I don’t like totalitarian governments any better than you do. Short of a gestapo agent in the bedroom, we can do a great deal with economic incentives. Right now, many Western countries are paying people to have children. We should be doing just the opposite–taxing parenthood up front, then returning the tax gradually over 18 years in the form of education and health care. There are desperate teenage girls who have a baby because it is the only way to collect a little subsistence money so they can get out of unlivable homes. I am a father of two daughters adopted from China. Taking these girls into my family has been the most rewarding thing I have done in my life, and has led to a richness of contacts and learning that I never could have imagined. Any country worried about population decline should encourage international adoption. Josh, I’m so pleased to see that intelligent people agree – how could it be otherwise with the facts in front of us? The problem is that most people aren’t intelligent and don’t agree – but simply and uncritically agree with ‘authorities’, mostly religious, and will not cooperate with those who want to take the ‘wiser’ path. In China a war won by radicals with absolute power allowed them effect change, but here in the US it has to be by democratic processes. However, while the ‘smart’ people were living ‘sustainable’ lives and having small families – the others were doing the opposite. That seems to be a position taken by many religions in asking their members to have as many children as possible – to expand their power-base, and maybe be ‘the last man standing’. Seems to me that this is a case of artificial selection encouraging the disproportional growth of dumb people as a fraction of the world’s population. You see you only need a couple of smart people to invent antibiotics, and the ‘dumb’ people, having all those children (on average) now have all those children survive to reproduce themselves, so even a single smart person who invents/discovers an antibiotic can disproportionately foment the growth of billions of dumb people, because, as they have more children per person than the ‘smart’ ones, they are disproportionately aided. Now add to that the birth rates occurring in places where the populations are the poorest and least educated, and controlled by religious authority – and what chance is there that those people will do anything other than what their parents did (in fact the IS phenomenon shows the younger generation to be even less accepting of change)? How likely are they to be more ‘enlightened’ than their parents or worse, better able to think critically – especially in the world of Internet ‘vision bites’ where knowledge is fragmentary and consists of ‘factoids’ and OMG ‘facts’. For sure the leaders of religious or political dictatorships don’t want too much critical thinking – in the past they’ve said it out loud, and now as then, in many Muslim countries it is punishable by death, (blasphemy laws, any questioning of tradition is blasphemy). So of your goals Josh, rapid switching to renewable energy – will occur in developed countries where it’s economic to do so – but Africa, with its growing population will remain with fossil fuels as will the mid-east (in spite of their excess of sunlight), and continue to raise CO2 levels. Even in democratic, ‘liberal’ countries, policies for having small families won’t be obeyed by the religious minorities which will eventually become majorities by dint of that. Laws to limiting fishing (and over-exploitation of natural resources in general) will be broken ever more frequently as human populations go hungry, and mass migrations of people will come from regions where we calculate it will be too hot to sustain human life, and they cannot be stopped except with armies ready to kill innocent civilians. So of course that answers your last point as well -about protecting natural land resources – see how well they are protected in the areas in Africa of almost continual wars – the wildlife are the victims as much or more than the people. Check out the reproductive rates by country (the CIA did it for you – see: https://www.cia.gov/library/publications/the-world-factbook/rankorder/2054rank.html), and you’ll see of the first 36 countries in the number of births per 1,000 people – are African countries – with the exception of Afghanistan ( ruled by Islamic fundamentalism) and then come the Islamic countries – from the highest birthrates per thousand being about 45 for Niger and Mali, going to less than 10 for industrialized nations in general, the more ‘advanced’ the lower the rate. Now I’m not a mathematician (though I teach it), but it seems to me that unless something drastic happens, the percentage of ‘scientific idiocy’ should increase world-wide, the percentage of people thinking at low, pre-Enlightenment levels will increase and the relative proportion of ‘smart’, educated people will decrease. People like Trump and Rouhani, and the Islamic State use the totally predictable opinions of the lower classes to gain and retain power (just as in ancient Rome – demagoguery is not a recent invention) – Tell them the Americans burn Korans (and the Jews spread the Black Plague), and they come out to burn our embassies (or the Jews – still an important goal of IS). So expecting some sort of real, enforceable agreements to preserve the planet and the people sounds unrealistic to me, more likely a total war decimating a majority of the Earth’s population sounds a more realistic ‘solution’. There you’d think the smart people would have an advantage. I prefer to think most people are not dumb but most people are followers. With good leadership, we could go in a very different direction. The leadership has had to pull every trick in the book to keep the populace deceived, subvert freedom of the press and then subvert free elections with gerrymandering and electronic manipulation of the vote count. When all else fails, charismatic populist leaders have been assassinated. Before we give up on democracy – let’s try it and see if it will take us where we want to go. What is it that civilized humanity needs? I use an acronym to keep the answer at the tip of my tongue:UPSEA – Universal Peace, Sustainability, Equality and Affluence. A quick survey will reveal zero political parties willing to stand up for this obvious precondition for humanitarian stability. This giant void is based upon the pervasive but illogical belief in capitalism, despite the total lack of a capitalist solution in theory, and most certainly not in practice, even after hundreds of years of opportunity to reveal itself. Alas, international communism is a swear-word, with no visible proponents. Horrors of failed communism in the impoverished Soviet Union and China have soured almost everyone to the idea, as we conveniently forget the numerous failed capitalist systems that preceded our own ongoing and intensifying failure at same. Your list of four solutions are idealistic and frankly pathetic in the face of the challenges before us, and I expected better from such a brilliant person. Thanks, Walter. I agree with you. If I have any brilliance, it is not in the area of leadership or social organization or creating a movement. I’m counting on people who have those talents to step up and show us the way. Politics is too important to be left to the politicians. That you can speak your truth boldly and admit error without flinching illustrates your brilliance, but I was not being gratuitous in my earlier flattery, as your exceptional sharpness was evident within moments of our first encounter, five years ago in Cambridge. We might be wrong together on this one, but that is approximately impossible. I spent more than three decades as a reluctant political activist, burdened with a solution that almost nobody wants to hear, but which could not be ethically abandoned for lack of a better plan, which I continually probed for. There still is no capitalist plan, anywhere, to take us to a peaceful and universally prosperous world, and i don’t think there ever will be. The sole, remote possibility is game-changing transhumanist hyperproductivity, but the issue of who is in control has not been believably addressed to my knowledge. Rather ignobly, I have abandoned communist activism because I became weary of endless rejection and failure, and shifted to age reversal as a more possible alternative. Darkly amusing, eh? We’re all going to live forever, haven’t you read? It’s all Teleromase based, except Telomerase is an enzyme that, at least in some cell lines, appears to overcome cellular senescence by extending the tips of the chromosomes called the telomeres–for more details please see another essay. Some have argued that if telomerase can avoid aging in cells in vitro, maybe it can be used to combat human aging (Fossel, 1996). A number of companies and labs are developing telomerase-based therapies to fight aging and at least one product, a natural product-derived telomerase activator called TA-65, is already available. One study reported that taking TA-65 may result in a decline of senescent immune system cells in patients (Harley et al., 2011). TA-65 can also increase telomerase levels in some mouse tissues and was reported to improve some health indicators in mice but it did not increase mean or maximum lifespan (de Jesus et al., 2011). Even though our knowledge of telomerase is still imperfect, I am skeptical such therapies will succeed (de Magalhaes and Toussaint, 2004a). Firstly, as detailed elsewhere, mice expressing lots of telomerase do not live longer. Moreover, telomerase is important in cellular proliferation yet many of our organs, such as the brain, are mostly composed of cells that do not proliferate. Hence, telomerase will do little to alleviate aging in these tissues. Lastly, there is some evidence telomerase favors tumorigenesis and so telomerase-based therapies may foster cancer development. Although research on telomerase is still in an early age, I have doubts about the efficiency and long-term safety of telomerase-based anti-aging therapies. The fact that TA-65 can increase telomerase levels but does not extend lifespan in mice (de Jesus et al., 2011) is in line with these thoughts. One high-profile study showed that telomerase reactivation reverses degeneration in mice (Jaskelioff et al., 2011). However, this study was conducted in animals that have no telomerase to begin with and thus develop a number of pathologies. Benefits from reactivating telomerase in mice that become sick for lack of telomerase are hardly surprising. Some companies are also selling telomere measurements to estimate biological age. Although telomere shortening may be a marker of certain diseases, there is no evidence at present that telomere length is a better indicator of biological age than chronological age. No matter what quackery they’re selling us this week, those are the facts. Darwin was correct then and he still is today, Evolution is in control, always has been, always will be. In the human brain the ratio of glia (non-neurons) to neurons is about 4 to 1; currently the numerical value of this ratio is quite uncertain ( http://blogs.scientificamerican.com/brainwaves/know-your-neurons-what-is-the-ratio-of-glia-to-neurons-in-the-brain/ ). The telomeres of the glia shorten as the glia divide. Most neurons do not divide; thus their telomeres do not shorten. Telomerase activation works only in telomeres that shorten. In activating my telomerase over the past 4 years I’ve found it to have several beneficial effects on my brain. For example, the essential tremor that plagued me for years has nearly completely reversed. Presumeably this has happened because my glia have become more youthful through telomerase activation. Based upon data that I find actionable but that are not published in the peer-reviewed biomedical literature, the hypothesis that telomerase activation causes cancer is falsified by the evidence. I gather from these data that consumption of TA-65 has a strong protective effect against cancer. In his Podcast on prostate cancer, Ed Park, MD estimates that there have been 2-3 new cases of cancer in his population of patients taking generic (cycloastragenol) or branded TA-65. This is a factor of 20 to 30 below the expected number in an age-matched population not taking a telomerase activator. Prior to starting on TA-65 the frequency with which I received a diagnosis of basal cell carcinoma in the sun damaged skin of my face was once per year. In the past couple of years the frequency has dropped to 0. Now, rather than getting precancerous actinic keratoses on my sun-damaged skin I get benign seborrheic keratoses. In addition to myself, my wife, son, daughter-in-law and golden retriever are all currently taking generic TA-65. None of us appear to have cancer. The manufacturer of TA-65 claims that no case of cancer is attributable to taking its product among the tens of thousands of people who have done so. Following a study by a panel of experts, the USFDA classified cycloastragenol as “generally regarded as safe” (GRAS). A person’s body contains telomeres that are of large number. Thus, there is no such thing as a person’s “telomere length.” There is such a thing as a person’s “mean leukocyte telomere length” in a sample that was drawn from this person’s blood on a specific date and time. The latter is a biomarker of a person’s body that might be shown to provide information about this person’s age at death and additional to the information provided by this person’s chronological age. Whether it could be shown to provide this additional information is independent of the argument for activating one’s telomerase. The argument for activating one’s telomerase is like the argument for changing the engine oil in one’s car periodically: it prevents trouble. On telomerase activation. I was eager to read the new Fossel’s book “The Telomerase Revolution”. It’s been a complete disappointment, nothing new that you can’t read on any blog, a waste of money and time. It’s like the main concern of the guy was to claim his supposed status in case the telomerase theory of aging gains traction. Your perceptive article certainly stands from the crowd! I am particularly impressed that you are one of the few who fully accept that biology is a network phenomenon and that biological evolution is most usefully regarded in terms of evolution of that network rather than of individual components such as “species”. Indeed this is a major theme of my latest book “The Intricacy Generator: Pushing Chemistry and Geometry Uphill”, which also underlines the observable reality that the evolution of our entire known universe is a network phenomenon of which biology is but one phase. An evolutionary continuum which can be traced at least as far back as the formation of chemical elements in the first stars right through the the latest most significant phase, the evolution of technology. I’m not sure if there is population modelling around any large scale life extension but I’d expect reduced birth rate would balance extensionists although genetic selection & diversity would diminish. Life extensionists seem to be driven by ego, fear of death & mortality. Life extension isn’t the biggest component of the problem, but it goes in the wrong direction. A longer life span reduces the “devil-may-care” mentality and makes it much harder to shift responsibility to the next Generation! Moreover, not everyone will choose a long lifespan. This could lead to a more diversified and more flexible Population. Finally, as already mentioned, only birth rate is relevant for a population explosion. In the long run, a minor elevation of birth rate will outcompete even a ten-fold increase in life span. I agree that the effect on population of longevity is small compared to the effect of the birth rate. I hope you’re right about attitudes toward the future. The biggest problem is religious fanatics, not normal religion. From Hasidim Jews, to Muslims, to Amish, even orthodox Catholics all purposely expanding their people, all have families of 6-10 children. That is what has be addressed. Each wanting to take control by forcing their culture thru massive expansion. In normal cultures as they get more successful they have less children unless instructed not to. This planet can easily have 50 billion in paradise with permacultue, aquaculture, food farms, underground homes in paridise park like settings and the massive oceans that could support mega floating Eco systems. Families of 4 in a house with a small amount of land, the total population of earth today could fit in Texas today. Just think of all the desert or arid lands that could easily be used being brought to life using all the knowledge we have now. It doesn’t take forever to recover land. By using the keyline method land has recovered in mere years vs decades. Well, I think technological advance is unstoppable. If there’s a way for life extension, people will take it. 99 of 100 will. Also I think in the near future we might even forget about agriculture the way we know it. I think it could be entirely possible to substitute photons with electrons in plastids or directly drive the electron transport chains of thylakoid and mitochondrial membranes. So that we could produce organic materials like food in factories using electric power. I once calculated that one hectare produces 40 W/m2 in southern Europe from solar power. If you use the same area to grow a corn field, you get 0.25W/m2 in organic materials mostly polysacharids. There is a tremendous room for improvment here. 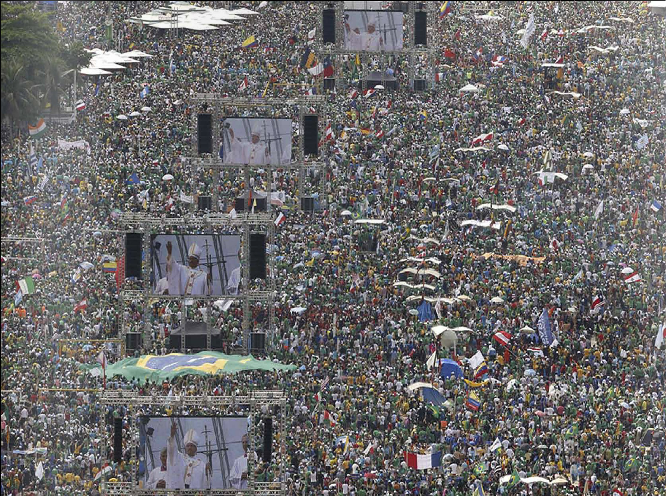 I think it might very well happen that by 2100 we will have 100 billion people living on earth. Very interesting and thought provoking. There is always the issue of balance between the interests of the individual and the group in a social society. We struggle for our own success at the expense of the group every day. This will never change. You can’t legislate out self interest. But through education we can modestly lean toward more social responsibility. That said, almost everyone wants to be healthier and live longer even if we are quick to criticize others for pursuing their own self interest. I believe dramatic life extension will become a reality. Right now, those who are lucky and are doing the right things, will extend their lives by 10-20 years. At the rate of the growth of our understanding of biology, a breakthrough will happen in the next 20 years. This will at least extend longevity even longer for those who can afford it and possibly allow some rejuvenation. Don’t expect to be pretty again, you’ll start to look like Yota. If free society remains intact, eventually death by old age will be eliminated for the rich. Reduced access to food and water by the poor will lead to war and terrorism and attacks on the old-ones by extremist groups. That’s the optimistic scenario. What will most likely happen is world war/world terrorism will squash our free society, or eliminate free thought, or simply destroy our economy to the point where scientific progress is stopped or pushed backward and without our magic pills, we will die just like biology programmed us to do. Happy new year! The conclusion that we must rapidly switch from consuming CO2 producing fossil fuels to consuming renewables is not scientifically supported, all research conducted to date having been been pseudoscientific. Rather than rapidly switching to renewables we should rapidly switch to the scientific method in conducting the associated policy research. Among the acts needing to be accomplished is to fire Obama’s “science” (actually pseudoscience) advisor. Terry – If what you mean is that we don’t know enough about climate dynamics to predict the consequences of global warming, I agree with you. But, in my opinion, global warming is not the worst consequence of fossil fuels. Ripping up the ground, destroying habitat, oil spills that poison, for example, the entire Gulf of Mexico and Gulf of Alaska. The US is now on a path to energy self-sufficiency that depends on fracking, which is far more environmentally destructive than classical extraction methods. I mean, actually, that methodological errors make of global warming climatology a pseudoscience; I prove this conclusion in the peer-reviewed article at http://wmbriggs.com/post/7923/. In my view, policy research on environmental issues (including the issue of whether fracking shall be prohibited or modified to eliminate its ill effects if any) should be conducted under the scientific method of investigation for only by conducting scientific research do we gain control over the ill effects from our interactions with our environment. Conduct of pseudoscientific research creates the illusion of providing for control without the reality of it. Hopefully by then the Real State will be Real cheap… on Mars 😉 Even more ‘shockingly’, those Tokamaks may actually have achieved break-even, just in time to be cornered into some niche by even cheaper solar. Ah the irony… seldom absent. I’m pinning my hopes on fusion and solar energy, electric cars, smart grids, 3D printing, vertical farming and synthetic fish foods that allow positive sum fish farming where you don’t deplete the aggregate fish stock which is still what happens with contemporary fish farming where they feed minced up wild fish to farmed fish. The CSIRO in Australia has made progress in this direction developing a synthetic feed that works very well with farmed prawns. The wealthier people become and the more education and work they have the fewer children they then have so global development will probably help too. Solar energy is now cheaper than fossil fuels, if accounting is done including externalized costs and subsidies are removed. I agree with almost all of what you wrote in this excellent blog post. My only concern with solar energy, especially solar panels, is the production process. Yes, they have fallen in price (which is good), but with a cost of questionable business practices. Ref this article (http://www.washingtonpost.com/wp-dyn/content/article/2008/03/08/AR2008030802595.html) where Chinese solar companies dump the byproduct silicon tetrachloride (a highly toxic substance) of polysilicon production into the nature with devastating consequences. Btw, looking forward to your new book with Dorion Sagan – one of my favorite science writers . Already pre-ordered. The problem is not overpopulation but individualism. Everyone thinks that he (she) would deserves more and want to have everything he can. The earth could sustain a population over 100 billion if everyone shared the resources with others and live modestly considering themselves to be integrated part of the society, and nothing without it. Josh, population crashes are well known, Liebig’s “Law of the Minimum” and that is where homo sap is heading this century. Despite Economist thoughtless positivism about Africa population growth, a crash there and elsewhere is a much more likely case this century. Our very new agricultural life (10,000 years out of 250,000 species life) yet alone urban/industrial (200 years out of 250,000 species life) should not lead to a surprise re cultural & political almost total lack of feedback – e.g. no consequences for decisions. Nature bats last and the four horsemen and still riding. Further this century will only be the first of a number of crashes as our species attains some cultural & political maturity over time. I recall reading a paper that the average lifespan of species is 7 million years, we have collectively lived 1/28 so in human life terms are 3 years old! I think doing well for 3 year olds. Following the sense of the population part of your discussion perhaps I could conclude that the earth already has too many people. Traditional hunter gatherer societies live in environments with high levels of biodiversity, but those same low impact lifestyles require 100’s of acres to support for a single family group long term. Our population densities have already outstripped the natural carrying capacity of a, hunter gatherer, earth by, maybe, 10^3 — 10^4 x. Still I get the sense your not so disturbed that we have outstripped to the extent we have; it’s just you don’t think it would be good to go beyond current levels. What’s your ecological argument for the right levels? Now, still unclear on your argument I come to the solutions. There seems to be a feeling that the China solution is reasonable – people cant be allowed to procreate to their own discretion. And then other unspecified policies to encourage smaller families. Here is an idea. I cant think of anything that has a proven record of promoting smaller families that the education of women. Its been so successful that industrial European and Asian societies are rapidly approaching or undergoing demographic transitions. Absent immigration populations across Europe and Asai are going to be decreasing and that seems to be guaranteed despite current trends in Longevity in those same societies. My idea here is that you most likely want to go full bore with morally good actions (education), first, before you tread towards the morally ambiguous (suggesting coercion). On the topic of environmental impact, I not sufficiently convinced that you have separated the issue of population from resource consumption. Are you happy with your current levels of resource consumption in the US. Are you going to be happy living in an identically populated world where everyone in India, China, and Africa lives at your level of resource consumption? No we will destroy the Earth. If you are an environmentalist, have you followed your ideals and voluntarily reduced your levels of consumption? Here is a comparison for you to go by. I live in major east coast Chinese city. If you want to shoot for better than average China levels of resource consumption which may or may not be sustainable (here) long term. You get a standard of living where you get a two room apartment for your family (the in-laws may or may not move in), there is no central heating (its -4 C today everyone wears winter clothes in the house), there is no car for the family(crowded public transpiration), appliances are a refrigerator and washing machine (hang your clothes out to dry). Also sometimes the water supply goes out. If you think your family and, more importantly your, neighbors will go for all that then I applaud you. If not, a workable plan would be to start thinking “how it’s going to be done”. Because as far as I can tell its not a problem with capitalism destroying the environment. The problem is people want to live a life which is convenient, varied, pleasurable, and comfortable. Those wants are not going to go away regardless of the economic system you choose. People are what they are, as nature made them. And so we come to Longevity. I have no idea what the effects of longevity will be on society. But I will offer something hopeful. The only reason the human species survives, even as I write this, is because it embodies in its members the knowledge and traditions that builds the modern society that we would all die without. Perhaps extending the life of that knowledge — allowing for more of its contributions and allowing more time for its traditions to be passed to the next generation will be a net positive effect. I suspect it will. With age comes wisdom, hopefully. In a world already saturated with uncaring and stupidity a bit more wisdom on the margin may have a net positive effect. I suspect it will. I think that we need to someday discuss what might cause the worst aspects of human nature. I think our great fear should be what will happen if someone evil becomes immortal and takes over somehow. IF we are going to reduce birthrates, then women’s empowerment should also be a central cause, along with sexual education and efforts to alleviate poverty. Sadly this is not happening with the current politically conservative group of people in charge.